Although people thought Gerald Ford was an honest man, Richard Nixon had promoted him to office of Vice President. That association left a bad taste in people’s mouths. Jimmy Carter came from the Deep South and had no connections with Washington politicians. People liked the fact that he was an outsider and elected him President instead of Gerald Ford in the 1976 election. Being an outsider became a problem for Carter once he was in office. Congress didn’t want to work with him and often vetoed his bills. The economic recession worsened and more people lost their jobs. People couldn’t afford to buy houses. At the same time, international issues plagued him. In 1979, Iranians broke into the U.S. Embassy in Tehran and took 52 people hostage for 444 days. Jimmy Carter was no longer the popular outsider even though many of the country’s problems were beyond his control. Ronald Reagan beat him easily in the next election. Jimmy Carter was born October 1, 1924 in Plains, Georgia. His family owned a store and a farm. Carter wanted to be a sailor. He graduated from the U.S. Naval Academy at Annapolis and joined the U.S. Navy. He became a nuclear submarine engineer. Carter’s father died when he was 29. Carter left the navy and returned home to run the family store and peanut farm. He was a successful businessman. Carter married his sister’s best friend, Rosalyn Smith, in 1946. They have four children. Carter served in the Georgia Senate and was governor of Georgia before becoming President. During his years as President, Carter insisted on a more casual White House. He always greeted White House staff and said thank you. He asked Secret Service men to smile more and stop opening doors for him. He asked White House cooks to make simple, southern dishes like grits, country ham, and red eye gravy. He believes strongly in equal rights for all people. Carter was only 56-years-old when he left the White House. Since then, he and his wife have actively worked to reduce poverty and improve conditions worldwide. Carter has written several books and teaches at Emory University in Atlanta. He helps negotiate peace agreements between countries at the Carter Center. He received the Nobel Peace Prize in 2002 for his work. Question: What role did Rosalyn Carter play in the White House? Answer: Jimmy Carter viewed Rosalyn as an active player in the Presidency. They went out to lunch every Thursday to talk about important decisions. Carter often sent Rosalyn notes asking for her opinion. 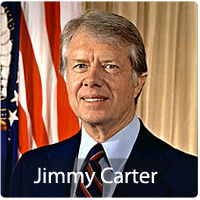 Visit PBS to learn more about Jimmy Carter.